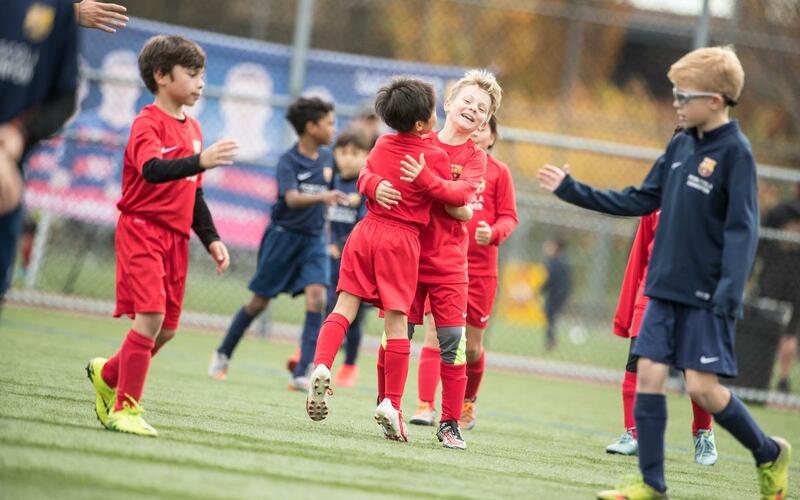 Last weekend, a total of 301 athletes became the first participants in the FCBEscola Tournament between the pupils at FC Barcelona’s four centres in Canada: Vancouver, Edmonton, Toronto and Ottawa. Over three days of competition, from October 27 to 29, a total of 124 matches were played between 31 teams, 8 in the U8 category (born 2008 to 2010), 9 in U10 (2006-2007), 8 in U12 (2004-2005) and 6 in U14 (2001-2003). The youngest age group was won by FCBEscola Vancouver Crimson, who won the final 4-3 against FCBEscola Camps, who they had already beaten 3-1 in qualifying, while third place went to their colleagues from FCBEscola Vancouver Blue. The U10 competition was won by FCBEscola Toronto Grana by beating FCBEscola Vancouver Blue in the final, 4-2, and with FCBEscola Vancouver Yellow coming third. In U12, FCBEscola Camps won the final 1-0 against FCBEscola Vancouver Yellow with the two teams from Edmonton playing for bronze and the Blue team taking the win 1.-0. Finally, U14 gold went to FCBEscola Vancouver Grana after they beat FCBEscola Edmonton Grana 2-1 in the final, and FCBEscola Toronto won the third place match.